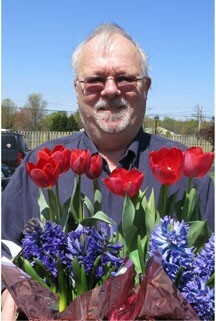 Photo is of Eugenia Thornton’s husband bringing her flowers a few years ago. longer than doctors at Johns Hopkins predicted possible. Just as flowers can warm a woman’s heart, some widely-studied medicinal plants derived from botanical sources could also potentially protect a woman’s heart from cardiovascular disease (CVD). The effects of oxidative stress can best be understood by visualizing a cut apple left out on the counter. As the air interacts with the creamy inner flesh of the apple, the moist white turns into a yucky dried up brown. This is what happens to all cells in our bodies (including our heart muscle cells, or “cardiomyocytes”) when they are exposed to oxygen. But, if you sprinkle lemon juice on the cut apple, the browning slows. This is what happens to our cells when Nrf2 is phytochemically activated through phase II enzymes. Nrf2 is shorthand for “Nuclear factor (erythroid-derived 2)-like 2”. Activation of Nrf2 has been suggested to be an important step in reducing oxidative stress associated with CVD, according to this study’s researchers. The plants are Bacopa Monniera, Silybum marianum (milk thistle), Withania Somnifera (Ashwagandha), Camellia Sinensis (green tea), and Curcuma longa (Turmeric), marketed as Protandim. You can only order this product directly from the manufacturer via independent distributors’ websites. This Valentine’s Day – and every day – give your heart the gift of flowers. 3. An enzyme system involved in detoxification. ← Previous Story Rent The Schwartz! Next Story → The CDCC Adds New Benefit for Members!